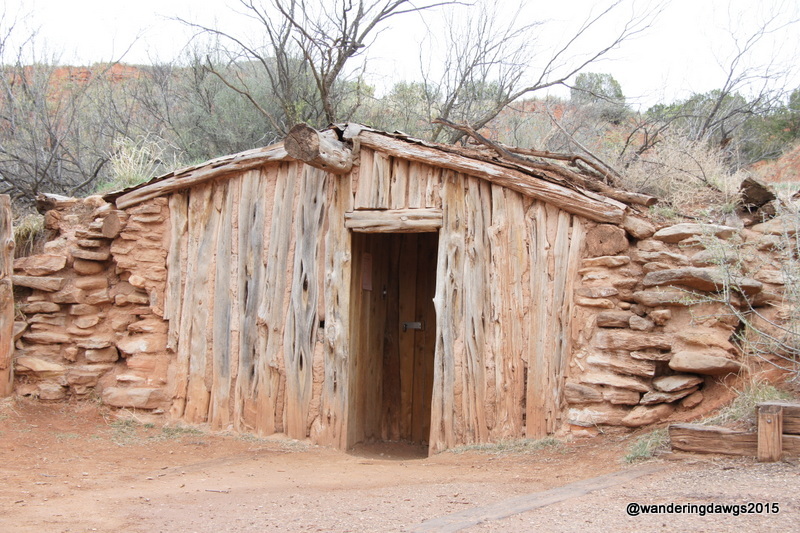 I was really looking forward to camping in Palo Duro Canyon. Just the idea of looking up at the canyon walls from our campsite was enough to plan our trip around a stay in the park. 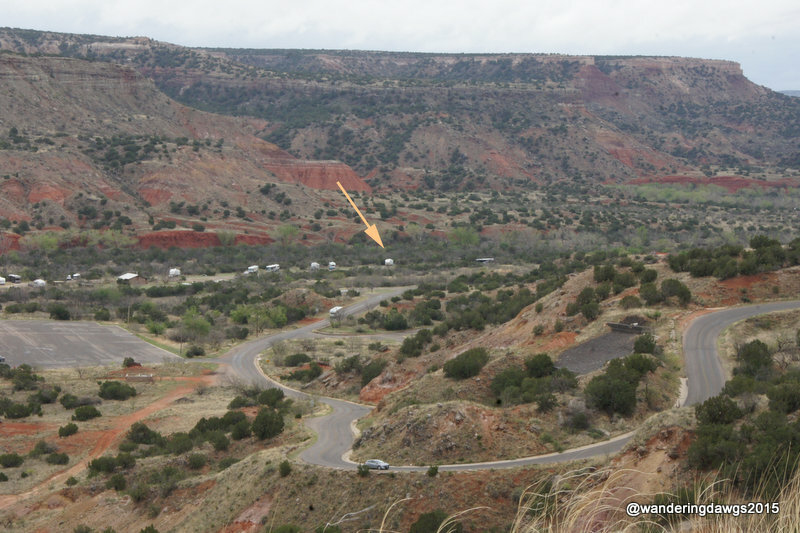 It was worth the two mile drive into Palo Duro Canyon down several switchbacks and a 10% grade to get to one of our most memorable campsites in all of our camping years. 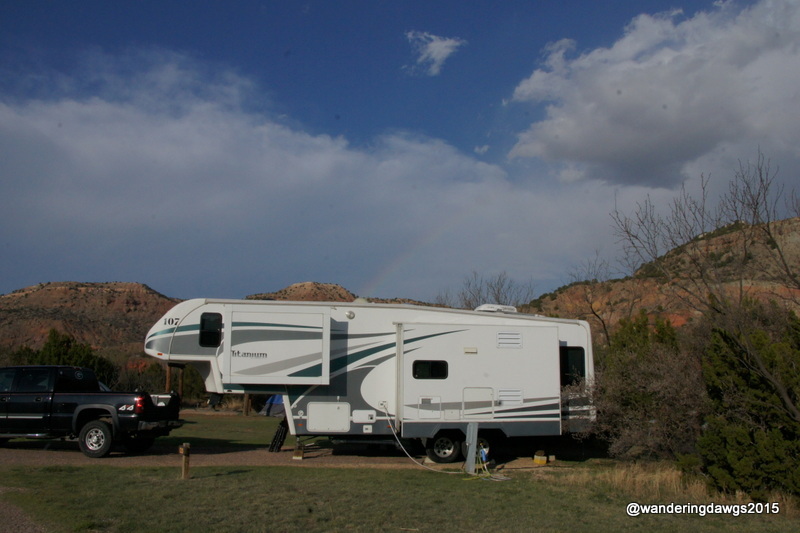 Our site in the Sagebrush campground had great views of the canyon and a private little sitting area behind our RV. 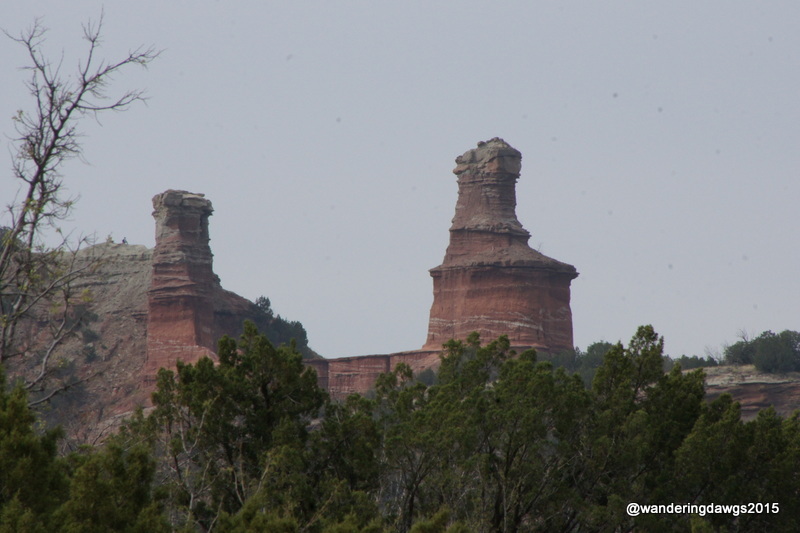 Known as the Grand Canyon of Texas, Palo Duro Canyon is the second largest canyon in the United States. With 16 miles of paved roads through the canyon and miles of hiking, biking, and horse trails, there is enough to make everyone happy. One of the most popular trails in the park is the Lighthouse Trail through the canyon for a close up look at the Lighthouse formation, the symbol of the state park. The multi-use trail is about a 6 mile round trip from the parking lot. We started out early on a cool Sunday morning and encountered cyclists, runners, and other hikers but no horses along the trail. A transplanted Georgian who now lives in Amarillo stopped to chat as we passed each other on the trail. The trail was packed red dirt and rock but not difficult. Our plan was to go to the base of the lighthouse but when two different hikers stopped to tell us about two rattlesnakes ahead of us I was done. Henry went a little farther and tried to convince me there was no sign of them but I wouldn’t budge! I was tired and ready to head back so we turned around about .2 miles before the end of the trail. We were done for the day when we got back to the campsite and loafed the rest of the afternoon. Is this a purple sage beside the trail? Although there was no wildlife along the trail (except for the rattlesnakes we didn’t see) there was plenty of wildlife in the park. 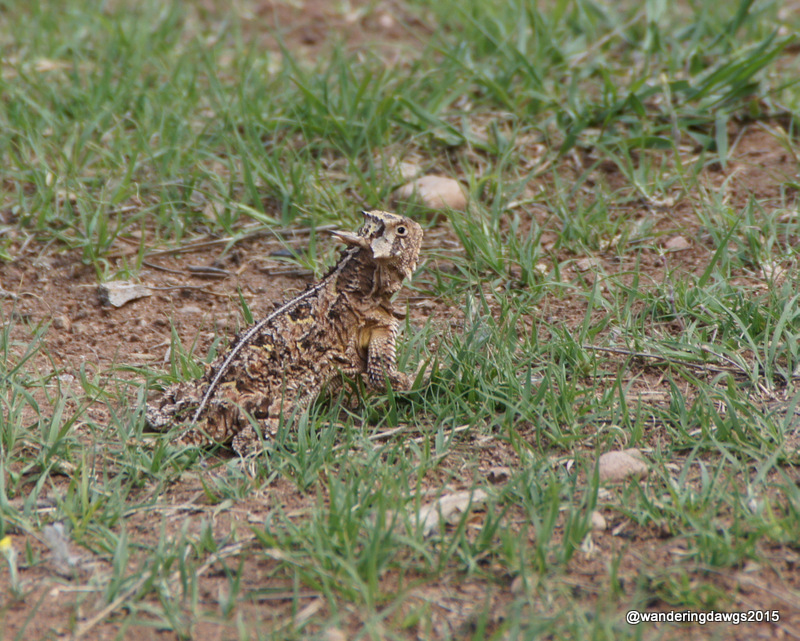 On the first afternoon I spotted a threatened Texas Horned Lizard in our campsite. 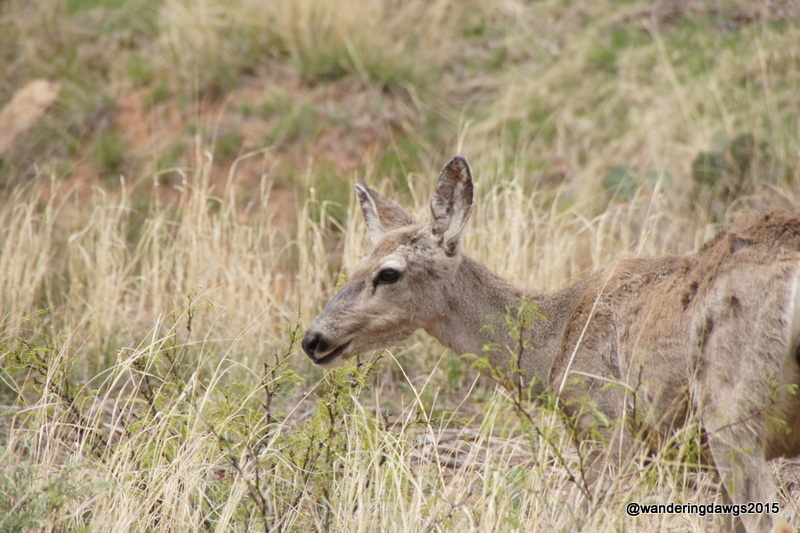 This Mule Deer beside the road wasn’t afraid of me. 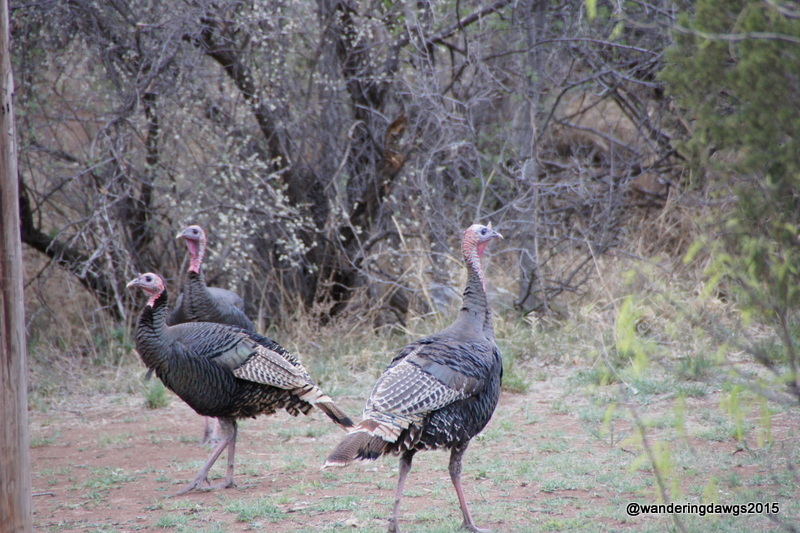 Wild Turkeys wandered through the campground one evening. We took a short hike to explore the Hole In the Wall. And explored the replica of a Cowboy Dugout. There was a rainbow one afternoon. 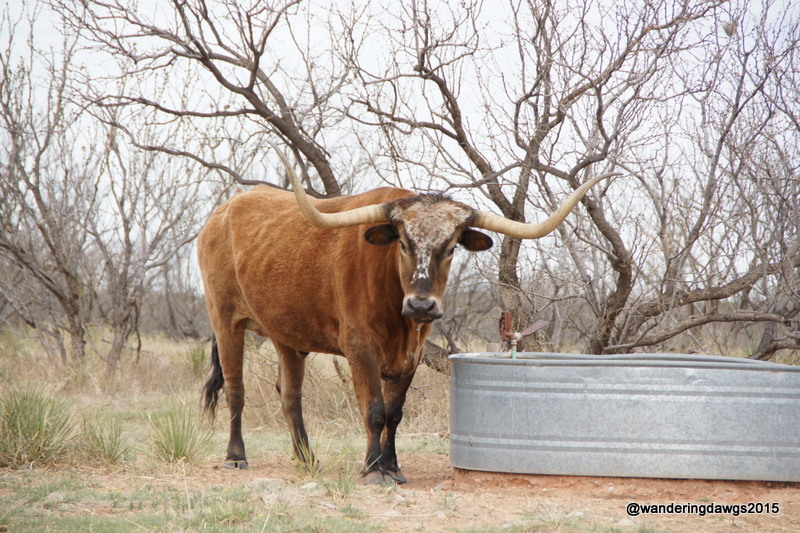 We saw T-Bone, one of the resident Texas Longhorns in the park. We enjoyed our stay so much I think this is now my favorite state park! 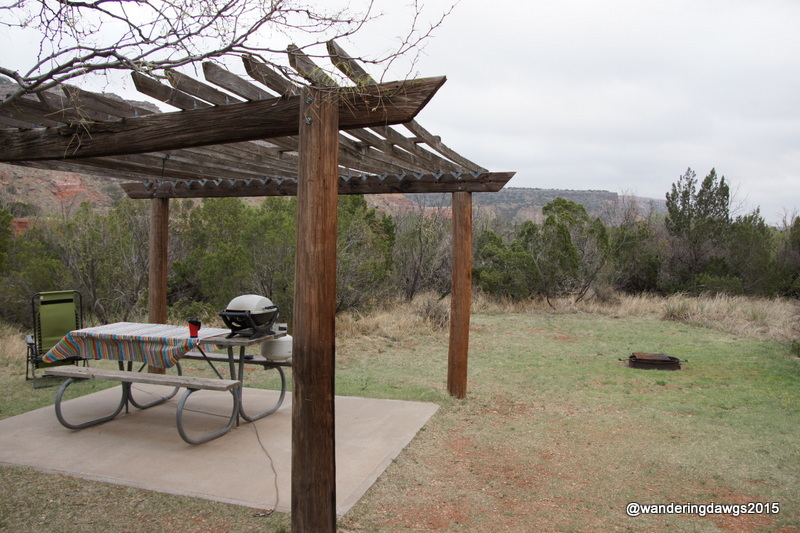 There are several campgrounds in Palo Duro Canyon State Park with backpacking, equestrian sites, tent sites, and RV sites with water and electricity.Our site in the Sagebrush Campground had large private sitting area with a covered shelter over the picnic table and a fire ring. There are hiking, biking and equestrian trails. There are also several day use picnic areas, cabins, stables with guided horseback rides, an interpretive center, and the Trading Post Restaurant and Park store. If you would like to read my detailed campground review of this park, click here.